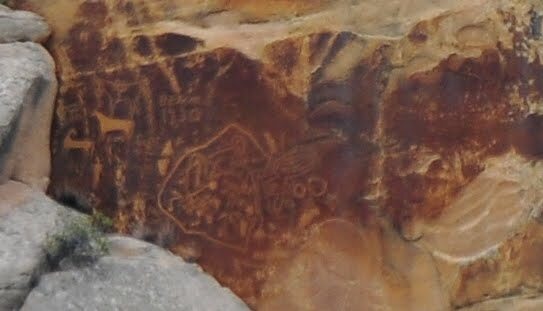 Rock Creek has some of the most detailed and immense amounts of Spanish history than anywhere else in the Uintah's within its' canyon walls. 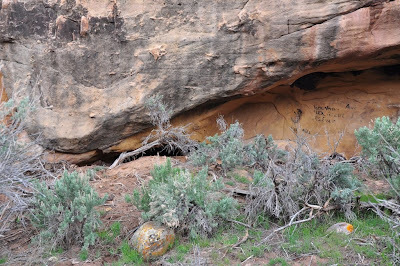 This is the location of the old Spanish Mission, the Water Trap, many sacred Ute and key Rhoades mines, decorated Ute pictographs, panels and Spanish carvings. The secrets here run deep and are difficult to unmask without much time, research, blood, sweat and tears. That's what makes this place one of my favorite to explore! Gale Rhoades published these maps in his book "Lost Gold of the Uintah" which shows the Treasure Hill area. 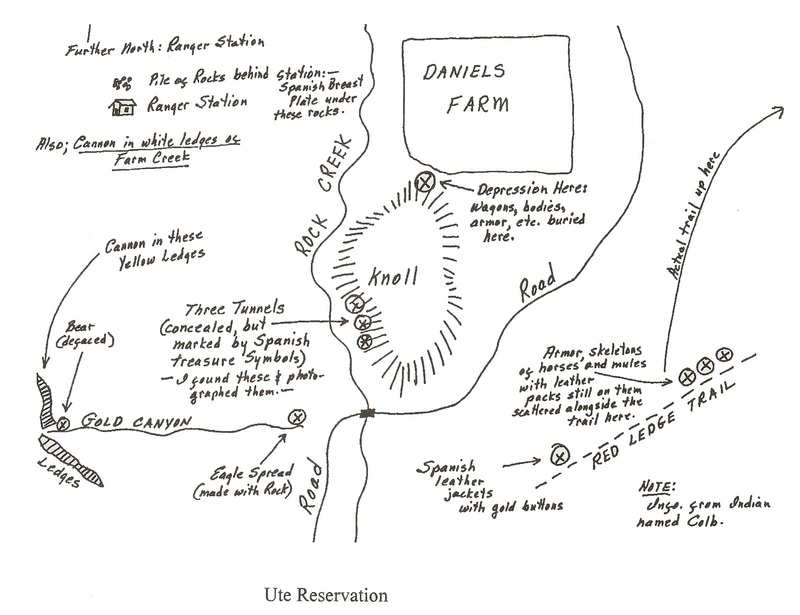 This is a picture of Treasure Hill looking across the old Daniels farm. This was the resting place for Spanish treasure until shipment back to Santa Fe and on to Spain could be arranged. 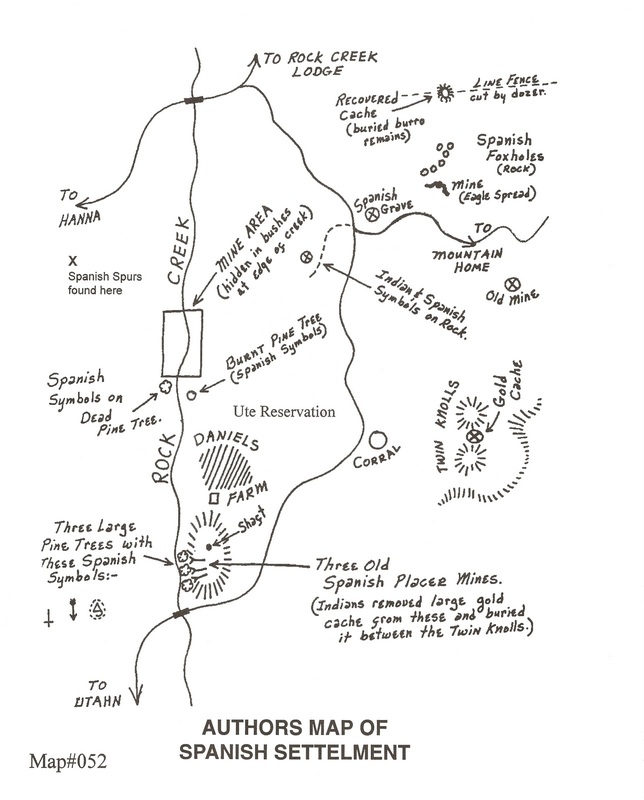 Being close to the Mission the Spanish could keep a close eye on their hoard. To protect their investment they devised a proper method to keep unwanted visitors out of their vault. A "Water Trap" was build at the entrance forcing thieves to swim through a series of underwater passages to gain entrance. The water remains year round due to its proximity to the river. 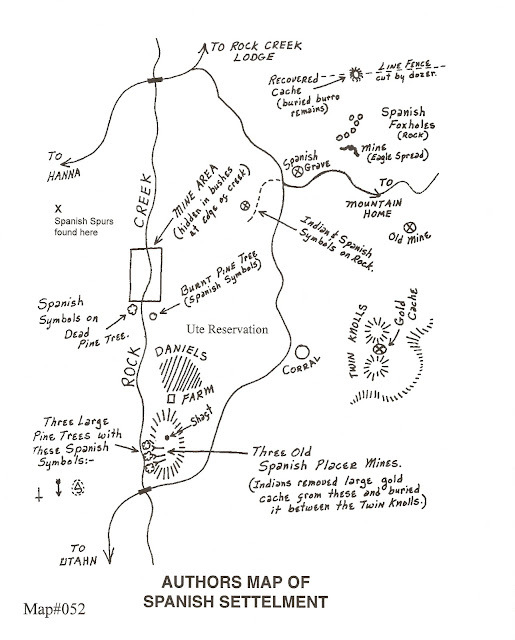 The entrance itself is not difficult to find, but is on Indian land. Permission must be obtained to visit here or strict penalties can and have been imposed. This is looking into the black waters of the trap. It can be a life threatening decision to try and swim one of these, let alone several in a row. This cross is still located along the base of the hill not far from the water trap entrance. The 'T' and upside down 'T' have generated discussion as to the veracity of this symbol. Some believe it to be a ranchers 'T' shaped branding iron that was used to create the cross lower down on this old ponderosa. This symbol is believed to represent the Spanish mission that was located along the river. Only stumps and a few lines of rocks are all that remain of the mission today. 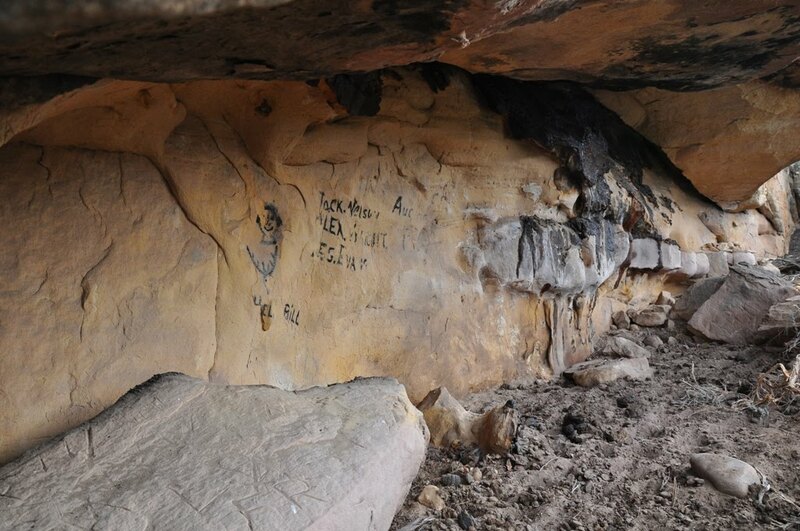 This shows more clearly the writings above that have been damaged by vandals over the years. The left hand side of this overhand leads into a small cave filled with rodent nests and guano. Charcoal writings and carvings are found all along this alcove. With its close proximity to the old mission this could have been a great locations to store some gold. The guano seeping out of the roof was a dead give away that a cave was located behind this wall. This was obviously a sacred location to the Utes. 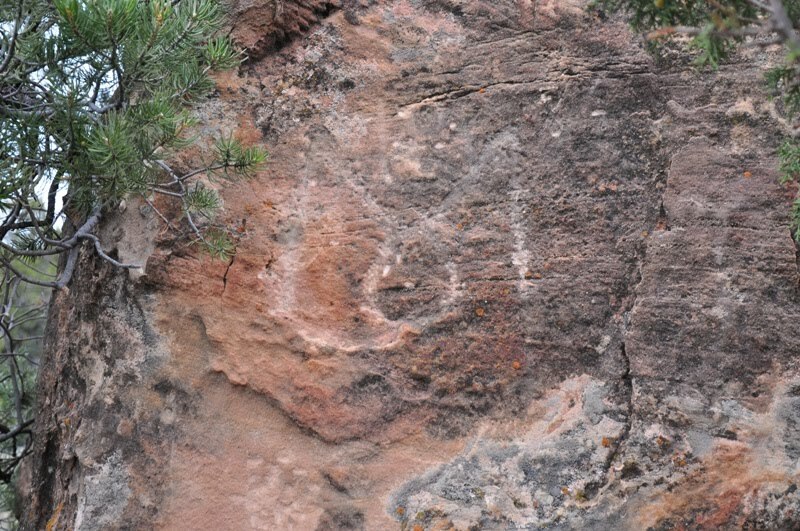 Rock art panels are found all along the lower reaches of Rock Creek. This one depicts horses and some figures near them. It also contains a very confusing map like depiction in the lower right of the panel. If you look closely you can see the date of "1730" carved into this panel. 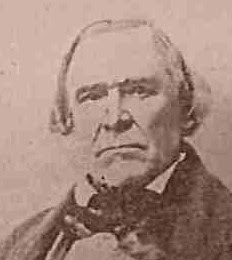 This could have been done by a early Spanish explorer or simply done as a more recent hoax. These are many times impossible to verify. This one is very intriguing and appears to have several different carvings and paintings from different time periods. A good friend of mine spotted the Perez mine while exploring Cabin creek. 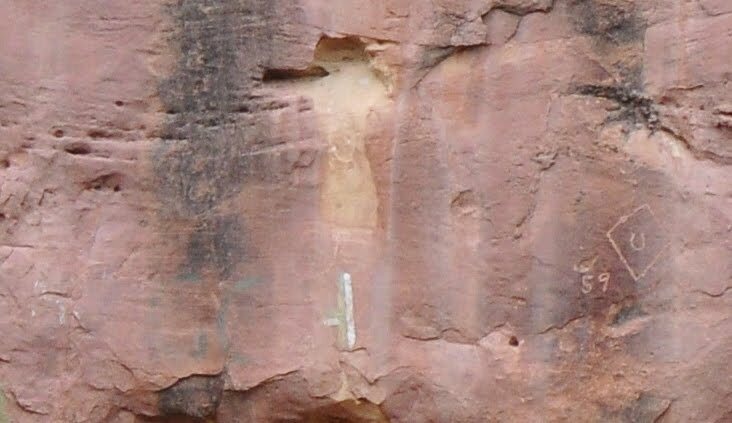 From across the canyon they could see a small opening in a maze of ledges North and West of Upper Stillwater dam. When they arrived at the old mine neither dared enter due to its poor condition and the lack of interest. Hanging in a tree was an old rusted can with a wrapped up piece of leather containing the original claim description of the mine. The old cabins are almost completely gone now. You can still make out their location and a couple of logs if you in the area. They are easy to find and right off the trail after it crosses the river. 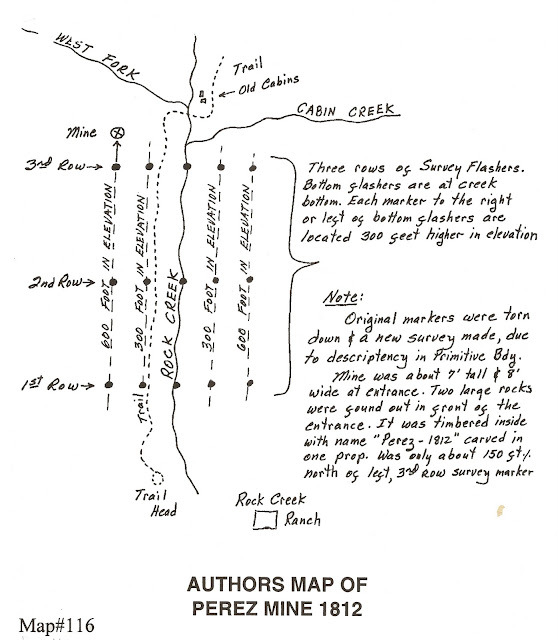 Gale Rhoades published the following maps of the Perez mine in his book "Lost Gold of the Uintah". My friend found it right about where it is marked in the following maps. 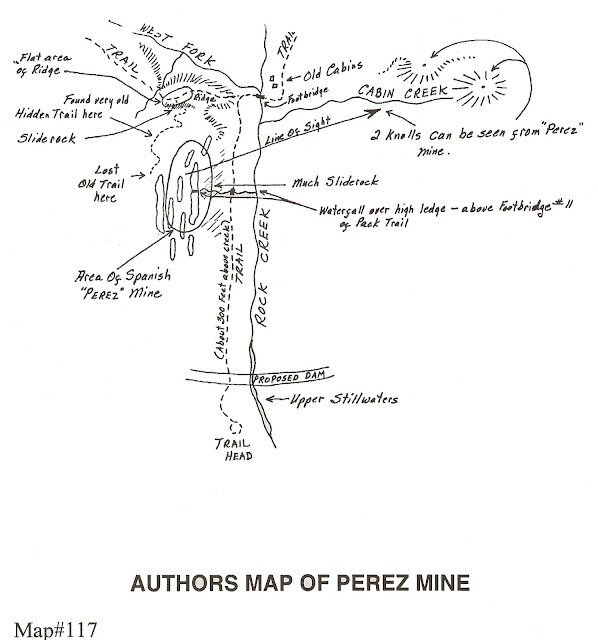 While our search to relocate the Perez mine was unsuccessful, we did stumbled upon this small hole. 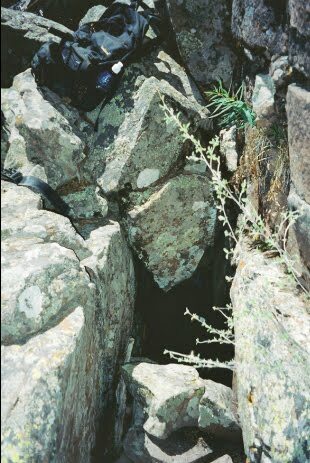 Upon climbing inside it lead into a deep narrow crack. There are many hidden places like this all along the canyon. Finding the one with the hidden vein of gold or the forgotten smelted bars is becoming the near impossible challenge. WOW! Thanks for sharing this. I've been learning about our Spanish history and this gave it more meaning. I can't wait until one day I can go see it for myself.